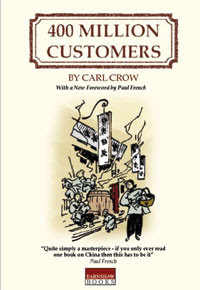 Paul French is the Shanghai-based author of Carl Crow, a Tough Old China Hand and keeps the blog China Rhyming, as well as acting as publishing and marketing director at Access Asia. French's next book, Through the Looking Glass: China's Foreign Journalists from the Opium Wars to Mao, will be published June 1 by Hong Kong University Press. Obama claims to be a break with the past by which, in a very American way of defining the past, he seems to mean the last few years. Instructive as some recent China books may be, perhaps the President would care to go back a bit further and consider the opinions of some older Americans and one Brit with plenty of China experience. The revival of American extraterritoriality (extrality) in Iraq does not appear to have spurred much interest in historians to go back and look at previous examples of the practise. But in pre-revolution Shanghai, Americans were at the forefront of the debate and history has a tendency to echo. So he might benefit from ploughing through the great American journalist in Shanghai Thomas Fairfax Millard’s The End of Extraterritoriality in China (1931). Millard’s book influenced a whole gang of Americans in Shanghai to oppose extrality – China Weekly Review editor JB Powell did and he was drummed out of the right wing American Chamber of Commerce in Shanghai (some things never change!) for his position. A more recent exa mination of the failings of America’s attempts at extrality in China, Ellen P. Scully’s Bargaining With the State from Afar: American Citizenship in Treaty Port China 1844-1942 (2001), might also prove useful. The President is presumably a rather busy chap at the moment and doesn’t have much time for reading so there’s no need to overburden him. Perhaps the most instructive read to prepare him for the “experts” that will inundate him is a book that might or might not have ever existed – Tony Keswick’s Everything I Know About China which has become an old Shanghai legend. Keswick was the taipan of Jardine Matheson in Shanghai up until WW2. He rarely gave interviews and when he did would sit opposite the eager journalist with a coffee table between them upon which was a leather-bound and beautifully embossed copy of Everything I Know About China. Half way through the interview he would excuse himself from the room, go next door and peep through a spy hole in the wall to watch the journalist, knowing they wouldn’t be able to resist opening the book for a peek. Inside were 200 completely empty pages. You get the point hopefully?